One of the most fun parts of celebrating National Pie Month this way is that we’ve been able to share the pie love with our friends. This Saturday we had friends over to help us eat this stewed pork pie and a winter banana pudding, so I had the opportunity to get creative. The coolest thing for me about doing such a focused month o’ pie has been the challenge offered by creating and photographing very similar recipes. The challenge has been really great for getting my creative juices flowing. That, and we’ve been eating a lot of pie. I knew that I wanted the style and feel of these pork pies to be very different from the Smokey Chicken Pie we had last weekend. Even though the flavor and ingredients were so different, it was important for the pies to be visually different because a savory pie always sort of looks like a savory pie. So instead of a traditional pie format I opted for cup pies. 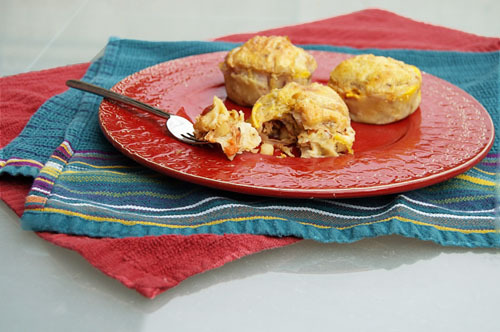 Cup pies are personal pies baked in a cup cake pan. The end result was both fun and delicious. In a crock pot or dutch oven combine all ingredients except the red onion. Cook under medium heat for 4 hours. 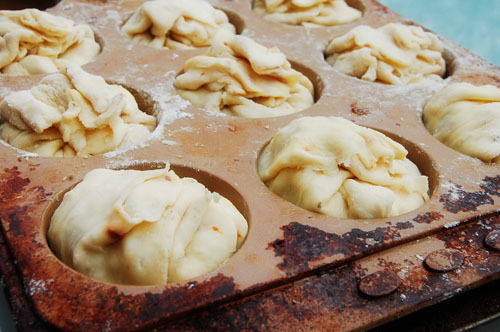 Start your pie dough. Sift dry ingredients. Using your hands, work in shortening. Cube butter and work it in. Continue to blend until the consistency is that of course cornmeal. Stir in the water, a little at a time until your dough forms a ball. Divide in half. Wrap each half in plastic wrap and refrigerate for at least 1 hour. After 4 hours, check the temperature of the pork. It should be between 160 and 170. Put the temperature to warm. Slice your onions and stir in. Using two forks, gently pull the pork apart so that it shreds. Allow to simmer in the juices for another 30 minutes. 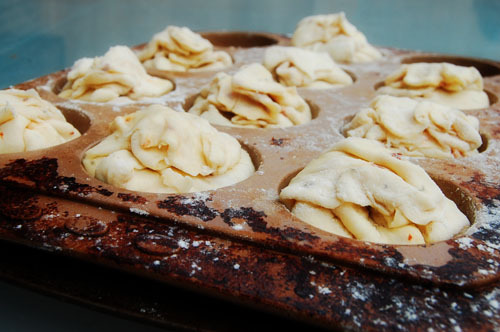 Remove the dough from the fridge. Roll it out on a floured, non-stick surface (like a sil-pat). Roll it out so it is 1/4″ thick. Cut in 4 x 4 squares. Oil a cupcake pan and place a square in each hole. Fill with the pork mixture. Pinch the edges together and fold over. Brush each pie with egg wash. Bake at 375 for 25 minutes or until golden brown. Let cool slightly and remove from pan. Serve. Between you and http://www.thepeche.com/ you guys are killing me with two months of pies…and I mean that in the very best way possible.